Kasauli cantonment was established by the Britishers in the year 1842 as hill station for its officers. Kasauli is located in the Solan district of Himachal Pradesh. This sleepy little town is at an an elevation of 1,900 metres above sea level. Kasauli has a pleasant climate throughout the year. In Winter temperature drops down to 5 degrees Celsius, with Summer temperatures rarely touching 34 degrees Celsius or more. One can get a break from the biting heat or the severe winter conditions in the plains. SUMMERS MAXIMUM 30 & MINIMUM 18 Degree Celsius. WINTERS MAXIMUM 15 & MINIMUM 0 Degree Celsius . Monsoon is an ideal season to enjoy the low flying clouds. Kasauli is known for its pleasant climate conditions. It’s being easily approachable from the plains makes it an ideal getaway for the tourists. It isn’t heavily crowded by the tourists so one can enjoy clean pollution free air . DECEMBER TO MARCH : One must carry heavy woolens as the weather can change any moment. APRIL TO JULY : One must carry light jacket or a shawl and t-shirts. JULY TO SEPTEMBER: An umbrella is a must as it’s rainy season. Light jacket and shawl would be recommended. 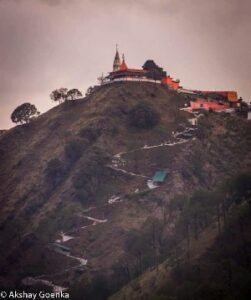 Monkey Point is the highest point of the town of Kasauli equivalent to shimla and is among the the attractions in kasauli and is very popular paces to visit in kasauli. 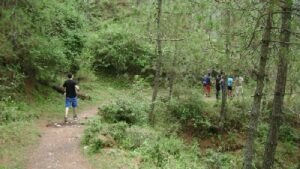 From here one can get a complete panoramic view of the plains of Chandigarh region and the river kaushalya flowing through the valleys. One can also spot a snow covered peak of chur dhar which is the highest peak of the surrounding region. 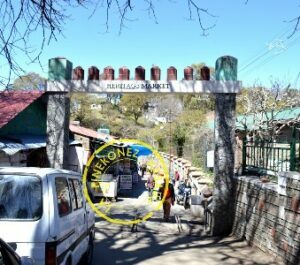 A temple dedicated to Lord Hanuman, is also situated at the Monkey Point. Lord Hanuman set his foot on this peak while returning from Himalayas with Sanjeevani booti. The top of hill is in a foot shape and the temple is said to be engraved with footmarks of the Hanuman. located on the upper mall is the sunset point. This area is popular among the tourists and one can enjoy the sunset and a quiet nature walk among amazing scenery. It offers a bird eye view of the plains. A little ahead of the sunset point is the gilbert trail.One can enjoy long walks admits the pine trees and capture some breathtaking sceneries. One can enjoy a walk down the cobbled pathway into the heritage market. One can get many eating options here. You must try the famous bun samosas of kasauli at the local tannu halwais shop. You can visit the Sharma photo studio situated in the jakki mull building. One gets to see some rare photographs of prominent personalities. Adjoining to the Sharma photo studio is the church of England. It was set up as a retreat for the British army men and their families. It was previously known as the Anglican church. It was established in 1880 by the civilans and service personnel as the kasauli reading and assembly room. It gained its present name in 1898 when a limited company was established. There is a dress code to be followed by the members. This would not only boost tourism in the kasauli, but also provide business opportunities for the underserved helipads.